Technology Integration is a four part series on essential questions, technology integration resources, web page design, and multimedia in projects. Sections contain relevant opening essays and resources. How is educational technology defined? How is technology affecting the learning process? What do we mean by technology integration? How should technology be used? What are courseware and digital content types for mathematics? What principles should guide your approach for integrating technology into instruction? When can you expect technology to be effective? What do you do, if you are not convinced you can integrate technology into your instruction? How does technology change thinking? What are some of the new technology terms, tools (e.g., blogs, podcasts, wikis) and concerns about integrating such tools into instruction? This is a glossary with resources related to Web 2.0 and beyond. How can innovations, including technology, be sustained in schools? Page 2: Building Internet, Search and Citation Skills, including some Web 2.0 resources that make conducting research easier. Historically, there have been numerous definitions and statements concerning the nature and function of educational technology, according to Saettler (2004). Educational technology has been a term including both instructional technologies, which focus on the teacher and the pedagogies they might employ, and learning technologies, which focus on the learner. Its meaning has been "intertwined with certain historical conceptions and practices or bound to specific philosophical and psychological theory as well as with particular scientific orientations" and clouded by "the tendency in some quarters to equate new information technology with a technology of instruction" (Saettler, 2004, p. 5). In the 20th century, four paradigm shifts, each with different philosophical and theoretical orientations, affected theory and practice and definitions of educational technology. Saettler characterized those as "(1) the physical science or media view; (2) the communications and systems concept; (3) the behavioral science-based view . . .; and (4) the cognitive science perspective" (p. 7). Definitions, and resulting mindset of the educational technologist, have been influenced by the nature of technology of the time and what could be done with it. In the early and mid-20th century, the focus was on using tools associated with instructional technologies from blackboards to overhead projectors, B. F. Skinner's learning machines, films and movies, and mainframe computers. However, the advent of computer terminals, personal computers, the Internet, and the growth of broadband communications in the late 20th century enabled mindset shifts toward learning technologies, as those advances enabled greater interactivity and increased possibilities for collaboration among learners. Thus in the 21st century, we see definitions reflecting a new mindset leaning toward learning technologies and on how instructional technologies can best serve learning. For example, the Association for Educational Communications and Technology (AECT) defined educational technology as "the study and ethical practice of facilitating learning and improving performance by creating, using and managing appropriate technological processes and resources” (Richey, Silber, & Ely, 2008, p. 24). AECT has also addressed this issue fully in its book Educational Technology: A Definition with Commentary, edited by Alan Januszewski and Michael Molenda (2007). Do you know some key people who have influenced or are presently influencing educational technology? Check out The Tech&Learning 100@30, a project for 2010 related to Tech&Learning's 30th anniversary. The first honorees were plucked from the past— the founding fathers and mothers whose inventions, declarations, and theories set the table for where we are today. This doesn’t mean they can’t be influential now or in the future. The goal was to recognize achievements from 1980 to the present, and even to recognize potential ground-breaking leaders of the future. The beginning of the list contains such familiar names as Bandura, Jobs, Gardner, Bloom, Gates, McLuhan, Gagne, Papert, Thornburg, Skinner and others. It has led to new and enhanced processes in math education. Technology is changing the nature of learning. As noted in the National Education Technology Plan 2010 (U.S. Department of Education, 2010), there are "three connected types of human learning—factual knowledge, procedural knowledge, and motivational engagement ... supported by three different brain systems. ... Social sciences reveal that human expertise integrates all three types of learning. Technology has increased our ability to both study and enhance all three types of learning" (p. 15). In general, contemporary digital learning environments with their multimedia components provide important learning opportunities: interactivity; adaptivity to a user's behavior, knowledge, and characteristics; feedback on performance, choices so that learners can regulate their own learning, nonlinear access, linked representations, open-ended learner input, and communications with other people (National Academies of Sciences, Engineering, and Medicine, 2018, pp. 165-166). One does not have to look far to see the affect and influence of the rise of broadband Internet connectivity, the increase in social networking, and greater use of mobile devices on learning. These have enabled those who possess technology to quickly capture knowledge and information, easily communicate, get feedback from, and collaborate with peers. Technology becomes another vehicle for creativity, self-expression, and self-production and publication. It allows for constant engagement. However, in promoting active use of technology such as seen in the figure found in the 2016 National Education Technology Plan (p. 18), the U.S. Department of Education (2016) noted that schools have a role to play not just in making technology available to close a digital divide, but to close a digital use divide by "ensuring all students understand how to use technology as a tool to engage in creative, productive, life-long learning rather than consuming passive content. Simply consuming media or completing digitized worksheets falls short" (p. 18). "Tablets change how we perceive computing." Consider apps with animation, interactivity, and the entertainment factor. "Education is gamified." Consider the impact on motivation when educators introduce elements of games into curriculum. However, the rise of digital communication platforms (e.g., use of Twitter and other social media hubs) does come with a potential danger in that "communication becomes truncated." Vali stated that "some students are losing the ability to articulate ideas in longer form. Additionally, they have fewer opportunities to engage in face-to-face communication. For that reason, it's important for educators to make sure students have the opportunity to participate in collaborative activities and face-to-face meetings" (section 4). "Hands-on learning" via mobile technologies. "Technologies such as the augmented reality Google Glass, digital and interactive paper, and animated learning through apps are changing the way education is becoming personalized. Today, forward-thinking learning centers avoid video lectures in favor of two-way interactions in which tutors walk students through problem solving and demonstrate new concept using tablets" (section 5). Unlike using a paper-based book with a finite number of pages, technology makes the user aware that acquisition of knowledge is potentially limitless. Knowledge is constantly evolving with the end result that complete mastery of any topic is not truly possible. Not all information is complete, there are multiple points of view and opinions on a topic that can easily be accessed. Not all of those perspectives are from authoritative, peer-reviewed sources. The ease of anyone publishing anything leads to a need for constant questioning of what one reads. The result is that schools must take a greater role in helping learners to critically evaluate online content. Wikiversity is "devoted to learning resources, learning projects, and research for use in all levels, types, and styles of education from pre-school to university, including professional training and informal learning" (Main page welcome section). Khan Academy claims you can learn anything for free working at your pace at the site: math, science, computer programming, history, art, economics, and more. YouTube Education even includes a channel for life long learning. School of Everything promotes itself as "the website that helps you learn whatever, whenever and wherever you want. From Biology to Beekeeping, History to Hula hooping" and more (About Us section). P2P Foundation is dedicated to "peer-to-peer dynamics in society," which are "most visible today in the many communities and movements self-organising around the co-creation of culture and knowledge. Well known general examples include the free/open source software movement; free culture; open hardware; and open access in education and science." (About the P2P Foundation section). MIT OpenCourseware is a web-based initiative that contains "virtually all MIT course content. OCW is open and available to the world" (About OCW section). OpenStudy, as the name implies, enables its users to "Connect with other students studying the same things. Get help and give help." "The advent of low-cost global communications has led to mass collaboration in the social, economic, and political sectors" (Lemke & Coughlin, 2009, p. 56) and has found its way into classrooms. Teachers and students can use tools such as blogs and wikis for participatory and authentic learning in the context of those global issues. Sophisticated media combining text and visuals is supporting multimodal learning, but at the same time is posing challenges for educators in terms of helping learners to interpret and understand multimedia messages (Lemke & Coughlin, 2009). Caution: This multimodal learning is evident in what 21st century students have come to expect in their learning. They want learning on demand and speed is the name of the game. They are not afraid of technology. They multi-task, think less linearly than those of us over 30, enjoy fantasy as an element of their lives, are less tolerant of passive activities, and use their tools to stay connected with each other. That connectedness is the main goal of their multitasking, according to Sprenger (2009), rather than for being productive. However, excessive connectedness can lead to stress, which overtime can potentially "lower the effectiveness of the immune system, weaken cognitive functioning, and, in some cases, lead to depression" (p. 36). Their excessive communicating digitally, while being efficient, also has the potential to weaken the development of emotional intelligence in dealing with face-to-face situations (e.g., reading facial cues and body language). "Many parents intuitively understand that ubiquitous glowing screens are having a negative effect on kids. We see the aggressive temper tantrums when the devices are taken away and the wandering attention spans when children are not perpetually stimulated by their hyper-arousing devices. Worse, we see children who become bored, apathetic, uninteresting and uninterested when not plugged in" (para. 10). "We now know that those iPads, smartphones and Xboxes are a form of digital drug. Recent brain imaging research is showing that they affect the brain’s frontal cortex — which controls executive functioning, including impulse control — in exactly the same way that cocaine does" (para. 12). These behavioral changes might also manifest themselves in school and in learning. The use of technology has also brought about a rise in multitasking. The rapid way in which ideas become freely available, the desire to get that information quickly, and the instantaneous way of switching from one source to another potentially affects learning in yet other ways. While Schmidt (2010) noted benefits of technology (e.g., online gaming improves strategic reasoning, navigational reasoning, and hand-eye coordination), he voiced a concern that people might be losing deep-reading skills, as they spend less time reading long-form literature passages. This probably has an effect on cognition and reading, although no one really knows what that does. Multitasking does not render learning impossible. It does not even necessarily make it more difficult to accomplish tasks. However, we can safely conclude that task-switching in particular increases the amount of time needed to finish a task. Multitasking is likely to change learning qualitatively by making the learner rely on different memory systems that vary in flexibility when it comes to the use of knowledge. Adults should facilitate young people's engagement with digital media. "Contrary to adult perceptions, while hanging out online, youth are picking up basic social and technical skills they need to fully participate in contemporary society. Erecting barriers to participation deprives teens of access to these forms of learning" (p. 2). Youth using new media often learn from their peers, not teachers or adults. Yet, in interest-driven participation, adults have an important role to play (e.g. in setting learning goals) (pp. 2-3). Learn more on how to implement peer instruction. "Peer Instruction is a research-based, interactive teaching method developed by Eric Mazur in the 1990s. It has been adopted across the disciplines, institutional types, and throughout the world." To learn more about peer instruction, visit the Peer Instruction Network, "a global community for current and future users of Peer Instruction and related interactive teaching methods" (About section). You'll also find valuable articles on peer instruction and the flipped classroom in Julie Schell's "official peer instruction" blog, Turn to Your Neighbor. Commenting on results of a Pew Internet & American Life Project report, psychology professor Larry Rosen (2013) pointed out the multitasking with technology that learners do also can negatively affect academic performance in school as learners are unable to focus for long periods of time on any one task. They might be only able to stay on task for as little as 3-5 minutes before being distracted by such things as having multiple devices in their study environments (e.g., iPods, laptops, smart phones), texting, and using Facebook (p. 62). Jeffrey Kuznekoff and Scott Titsworth (2013) provided additional evidence on the negative affect on academic performance of learners using mobile devices during class lectures. They found that "Students who were not using their mobile phones wrote down 62% more information in their notes, took more detailed notes, were able to recall more detailed information from the lecture, and scored a full letter grade and a half higher on a multiple choice test than those students who were actively using their mobile phones" (p. 233). They suggested informing students of the results of their research, perhaps including a short summary of it within a course syllabus as a way to help learners make a more informed decision on potential impact on their learning of using mobile phones during class lectures. Yet this might not be enough to convince learners that results might apply to them. At the end of the focus time, the tech break begins again, and the cycle continues. Teachers might begin with a focus time of about 15 minutes, gradually increasing the focus time between tech breaks. However, they might find the maximum focus time might reach about 30 minutes. Rosen indicated that this technique has also proved successful at the dinner table at home or in restaurants, and during business meetings. Technology has also contributed to a rise in informal learning, or at least has made it more evident. While content and courses are still viewed as the starting point of learning, George Siemens (2005a) indicated that the Web and the Internet are changing that, proof of which is illustrated in Ito and colleagues' study (2008) and in Lemke and Coughlin's view that the Internet has been a change agent for democratization of knowledge (2009). The majority of education no longer occurs in formal settings. People are learning "through communities of practice, personal networks, and through completion of work-related tasks" in an environment in which "[k]now-how and know-what is being supplemented with know-where (the understanding of where to find knowledge needed)" (Introduction section). Thus, he viewed making connections, not content, should be perceived as the beginning point of the learning process. Siemens' "connectivism" theory calls for a rethinking of learning in the digital age, illustrating that technology has led to new learning theory. To date theories of behaviorism, cognitivism, and constructivism have dominated instructional design and still have their place in the domains of learning (see Table 1). However, those theories are challenged in the digital age because "[m]any of the processes previously handled by learning theories (especially in cognitive information processing) can now be off-loaded to, or supported by, technology" (Siemens, 2005a, Introduction). In contrast to established theories of learning, the essence of connectivism is that learning is viewed as a connections/network-forming process (Siemens, 2005c). Connectivism recognizes that learning resides in a collective of individuals' opinions and even in non-human appliances. Core skills include an ability to see connections between fields, ideas, and concepts and to locate sources of unknown knowledge when you need it at its point of application. The intent of learning activities is currency (accurate, up-to-date knowledge). Because knowledge is increasing exponentially, it can rapidly change what is perceived as a reality. Thus, the decision making process (what to learn and its meaning) is a learning process itself (Siemens, 2005a). The process is complicated by new communications tools that have sprung up, which give greater end-user control over what is published on the Web, resulting in some amateur contributions of questionable quality. Get the scoop on learning theories. HOT: See the Great Wheel of All the Learning Theories that Teachers Need to Know About This interactive graphic shows the learning theorists, key concepts of their theories, learning paradigms or "world views," and the scientific disciplines associated with those. Learning-Theories.com "features more than 80 learning theories, models, and frameworks that address how people learn." Summaries are extensive on each. Ultimately, the value of the theory of connectivism is its link to the concept of life-long learning and personalization of it. According to Siemens (2005c), "We are moving from formal, rigid learning into an environment of informal, connection-based, network-creating learning...Knowing is no longer a destination. Knowing is a process of walking in varying degrees of alignment with a dynamic environment" (Conclusion section). Gone are the days of "this is what it is." Personalization is among trends driving the global economy, and this is no less true when working with technology, and the internet (Kelleher, 2006). However, Benjamin Riley (2017) noted "We need to stop treating technology use and personalization as synonymous" (p. 72). To-date there has been multiple interpretations of personalized learning, a lack of a common definition of it, and almost no evidence thusfar from rigorous research in support of it. In his view, common principles to many definitions of personalized learning include students having greater control over the content they learn and the pace at which they learn, and some use of technology to customize learning (Riley 2017). For personalized learning to really take-off in classrooms, technology will need to be at the forefront. Thomas Greaves (2012) indicated, the most effective implementations include a "well-implemented 1-to-1 laptop initiative," "learning management systems ...because they provide the framework that supports several different personalization functions without adding a lot of extra work for the teacher," "access to online remedial coursework," and "open access to search tools" (p. 35). However, consider the conclusion Paul France (Waters, 2018) reached after being actively involved with implementing personalized learning with technology for several years: “The vision was a curriculum that catered to every child so they’re learning at their level all the time,” he said. “But when every child is working on something different, you’re taking away the most human component in the learning process, which is social interaction—learning from one another and collaborating to solve problems. They’re developing a relationship with their tablet but not with each other” (para. 13). Waters (2018) also noted challenges from a RAND report: "Helping students work at their own pace can make group projects and collaboration more difficult because students are at different places, while also making it harder to prepare kids for year-end standardized tests" (para. 7). A true personalized learning environment (PLE) "draws on a variety of discrete tools, chosen by the learner, which can be connected or used in concert in a transparent way. ... a PLE is not simply a technology but an approach or process that is individualized by design, and thus different from person to person. It involves sociological and philosophical considerations and cannot be packaged, passed out, and handed around as a cell phone or tablet computer could. Widespread adoption of PLEs ... will almost certainly also require a shift in attitudes toward technology, teaching, and learning" (Johnson, Adams, & Haywood, 2011, p. 30). Before undertaking any implementation, Tomlinson (2017) suggested that educators reflect on why they want to implement personalized learning and have a vision for its purpose. How will this approach match with curriculum? "It's unwise to select an instructional direction without clarity about how compatible that direction is with local understandings about the nature of curriculum" (p. 13). Personalization might not work for all students in a school, or even in a classroom, or particular content area. For example, consider how you would provide quality educational experiences for learners challenged by "language acquisition, low proficiency in reading, emotional insecurity, a lack of background experiences, or even a weak attention span" (p. 14). Consider the affect of its implemenation on existing systems, such as schedules, grading practices, and teacher evaluations, particularly if teachers can opt in or out of the approach. What supports will teachers need logistically in the classroom, from professional development, and from school leadership? How will you involve parents in the change process? What changes would be needed in the school environment--would they conflict with any district or state-level mandates or expectations? (Tomlinson, 2017). Based on outcomes from a 2014 national summit on this topic hosted by the Friday Institute for Educational Innovation at North Carolina State University (Abbott, Basham, Nordmark, Schneiderman, Umpstead, Walter, & Wolf, 2014), key components in a redesigned personalized learning system would include mass customization; flexible, anytime, everywhere learning; a teacher role as "guide-on-the-side"; project-based, authentic learning; a student-driven learning path; and a mastery/competency-based progression/pace. We would need collaborative learning environments, "ongoing, embedded, and dynamic assessments of knowledge/skills, learning styles, and interests," and rather than a fixed-limited report card, we'd need portable electronic portfolio records, and integration of informal learning (pp. 2-3). It would require greater use of data, changes in curriculum, funding, policies, an enhanced technology architecture to access and manage data, content and communications; new research and development for what works for which students in a PLE, and new professional learning experiences, such as with differentiated instruction and blended learning instructional models (p. 5). Readers should not confuse "mass customization" with lack of standards. In a PLE, "each learner works toward achieving the same set of college- and career-ready standards with the support that they need along the way" (Friend, Patrick, Schneider, & Vander Ark, 2017, p. 5). Despite its challenges, classroom teachers and schools are implementing personalized learning, as Friend and his colleagues illustrated. Although there are differences in approaches, commonalities exist such as "kids learning individually and together, a combination of small group and whole group activities, demonstrations and instruction from the teacher, meaningful projects, extracurricular activities and more" (p. 6). "[S]chools that implement personalized learning often find they need to create "guardrails" or frameworks around the content students are supposed to learn and the pace at which they learn it. In other words, schools start to converge on a model not all that different from longstandng education models with a scope and sequence" (Riley, 2017, p. 71). Penuel and Johnson's (2016) Review of Continued Progress: Promising Evidence on Personalized Learning. This is a critique of the 2015 RAND Corporation research on three school-wide initiatives involving 62 schools promoting personalized learning. Overall, the reviewers concluded the research had many high quality elements; however, owing to its limitations, "Broad conclusions regarding the efficacy of technology-based personalized learning ... are not warranted by the research" (p. 1). John Pane's (2018) Strategies for Implementing Personalized Learning While Evidence and Resources Are Underdeveloped. In this report from the RAND Corporation, Pane offers "strategic guidance for designers of personalized learning programs to consider while the evidence base is catching up. This guidance draws on theory, basic principles from learning science, and the limited research that does exist on personalized learning and its component parts" (p. 1). A key reason for such guidance includes that "Presently, early implementers of personalized learning are working with imperfect evidence, underdeveloped curricular resources, and policies that might hinder their efforts" (p. 9). Visit Symbaloo to see how Algebra might be personalized for teaching and learning. You'll find a "webmix" of lesson plans, tutorials, and online tools for all levels of algebra. Don't let a one-computer classroom stop you from technology integration. You can now "work in the cloud." In the pass-it-on buddy method, students assist one another in creating the digital product. Barnett stated, "Choose and prepare the best technological tool to fit your learning target. Students complete an assignment on paper (for example, writing text for a blog entry). Teach one student to translate their work into a digital product. Schedule a buddy system: Student A teaches student B, student B teaches student C, and so on." Great for group work. In the group consensus method, "Small groups of students engage in dialogue on a particular topic, then a member uses a digital tool to report on the group's consensus." In the rotating scribe method, "Each day, one student uses technology [of his/her choice] to record the lesson for other students." Begin by modeling the process. "Then have the student record what happened in class: activities, explanations, student questions, discussion, etc. Review the scribe’s work after class. Begin class the next day by asking students to "evaluate" the scribe's report." In a whole class method, the group (or half of the class at a time) gathers around the computer to explore web sites, tools, games, videos, interactive quizzes, and so on. Groups can "share results, scores, impressions, or other information with each other." Post resources on a class web site, so that students might explore at home. Provide time in class for individuals to explore and then share their findings at the end of a unit. Let the group decide on the best discovery and then reward the student who made the discovery. Great tips! Read the article for additional details. What's the difference between personalization, differentiation and individualization in instruction? Individualization refers to instruction that is paced to the learning needs of different learners. Learning goals are the same for all students, but students can progress through the material at different speeds according to their learning needs. For example, students might take longer to progress through a given topic, skip topics that cover information they already know, or repeat topics they need more help on. These definitions above focus on instruction, rather than the learner, in the view of Barbara Bray and Kathleen McClaskey. They elaborated on the learner and these terms in their Report about Personalization vs Differentiation vs Individualization (V2) (2013) at Personalize Learning. For example, they noted that personalization is learner-centered in that the "learner drives their learning", and differentiation and individualization are teacher-centered. For differentiation, "the teacher provides instruction to groups of learners." For individualization, "the teacher provides instruction to an individual learner" (p. 3). They provide a full chart on the differences that is worth viewing. Personalized Learning: A Guide for Engaging Students with Technology by Peggy Grant and Dale Basye (2014) includes what you need to know to implement personalized learning with technology in your school setting. You'll learn why personalized learning is important and how it differs from differentiation and individualized learning, how personalization relates to the Common Core standards, and how personalization can transform teaching via the models of technology integration presented. Assessment in a personalized environment is addressed, along with policies and perspectives that make 1:1 and mobile device initiatives successful. The book concludes with funding information and a planning process for a 1:1 personalized learning program. Is adaptive learning the same as personalized learning? Educators have also been hearing about the buzzword "adaptive learning" in connection with products from ed tech companies and publishers (e.g., see Curriculum Associates i-Ready and Dreambox Learning). However, the term is not the same as "personalized learning." Per John Waters (2014), adaptive learning is "an approach to instruction and remediation that uses technology and accumulated data to provide customized program adjustments based on an individual student's level of demonstrated mastery" (online p. 1). Per K-12 Blueprint (2016), there are several types of adaptive learning products on the market today. For example, software might be interactive and self-paced; adaptive at the content level; adaptive at the assessment level; adaptive at both assessment and content levels; or include adaptive assessment and content with high granularity. High granularity would include the student recording each step used in solving the problem and feedback would also address the steps used by comparing those to effective methods for solving the problem. K-12 Blueprint includes multiple tools to help you learn more about personalized learning and adaptive learning. Technology is not required for personalization, the latter of which educators have been doing for decades. Read more in Adaptive Learning: Are We There Yet? at T.H.E. Journal. What's the difference between personalized learning and personalized instruction? Personalized instruction focuses on tailoring the pace, order, location, and the content of a lesson uniquely for each student ... It is a rebranding of the idea of individualized instruction first promoted in the 1970s, before the widespread availability of personalized computers. In the National Education Technology Plan 2016, the U.S. Department of Education (2016) referred to personalized learning as "instruction in which the pace of learning and the instructional approach are optimized for the needs of each learner. Learning objectives, instructional approaches, and instructional content (and its sequencing) all may vary based on learner needs. In addition, learning activities are meaningful and relevant to learners, driven by their interests, and are often self-initiated" (p. 7). Per Enyedy (2014), "the vast majority of systems on the market today fall into the category of Personalized Instruction" (p. 3). There is "so much variability in features and models for implementation that it is impossible to make reasonable claims about the efficacy of Personalized Instruction as a whole" (p. 5). For example, among features that might vary in personalized instruction systems are student choices (e.g., students might be given control of pace, when and where they learn, what topics to study, what resources to use) or teachers might make those choices for students. Personalized instruction might involve adaptive learning systems and/or intelligent tutoring systems where some of the control is given to the computer system itself with student performance on assessments being used to direct them to topics or resources. Variables in implementation models of personalized instruction include online instruction and blended instruction. In one year or less: collaborative environments and online communication tools. Johnson, Levine, Smith, and Smythe (2009) indicated, “both groups of technologies are now standard in the digital toolset of postsecondary students. In many grade schools, on the other hand, integrating these kinds of technologies into teaching and learning has proven difficult because of barriers such as policy constraints on using online tools, the fact that many students do not bring laptops to school (as opposed to many college students, who do), and policies that restrict Internet access in many schools” (p. 4). Within two to three years, mobiles and cloud computing. This time estimate "is a reflection of the fact that younger students are, at present, less likely than college-age students to carry mobile devices, especially Internet-capable ones — although there is a growing trend that suggests this will not always be the case — and that access to cloud-based applications is more difficult for younger students for the same reasons that collaborative environments and online communication tools are often out of reach” (p. 4). Note that cloud computing refers to large groups of networked servers, which have "made processing power and storage capacity available in abundant quantities. Applications that are developed to run in the cloud and take advantage of the ability to scale up or down along with the number of users and storage demands are changing the way we think about programs and files. Collaborative work, research, social networking, media sharing, virtual computers: all are enabled by applications that live in the cloud” (p. 5). In four to five years, smart objects and the personal web. Smart object appliances aimed at consumers are appearing on the market, and the technology shows promise for linking physical objects with rich caches of online content, but common use in schools is still several years away. The technology was placed on the same horizon in the higher education edition of the 2009 Horizon Report. The personal web, on the other hand, is perceived as being slightly closer to mainstream adoption in higher education than in grade schools; the topic appears on the mid-term horizon for higher education” (p. 4). From the 2010 K-12 Horizon Report, Johnson, Levine, Smith, and Haywood (2010) noted that cloud computing and collaborative environments remain as top emerging technologies for adoptions within 2010-2011, followed by interest in and rise of adoptions of game-based-learning and mobiles within two to three years from 2010. On a further horizon, set for four to five years away from 2010, look for adoptions of augmented reality and flexible displays, which are elaborated on within this report. Of key interest is that technology integration is challenged by the fundamental structure of K-12 education. Unfortunately, many activities related to learning and education that take place outside the school setting are often undervalued or not acknowledged. Learning Analytics: Leveraging Information Data is an infographic from informED. What can it do? What can it be used for? How it will affect the future? Why is it not widely used yet? Time to Adoption 1 yr. or less 2-3 yrs. 4-5 yrs. *To learn more about the IoT, view the video and read more: Everything You Need to Know about the Internet of Things Right Now from ZDNet (2018). **Horizon reports are archived. The last was in 2017. Horizon reports are also available in the Resources section at the Consortium for School Networking (COSN), which worked in partership with NMC to produce those annual reports. Driving K-12 Innovation is the successor to the New Media Consortium’s “Horizon K-12” reports. COSN's goal is to produce three shorter reports each year for the K-12 segment that focus on Hurdles, Accelerators, and Tech Enablers. The first of those reports was 2019 Hurdles. Educause took over the NMC as of February 2018. To further keep abreast of how technology is changing the learning process, visit MindShift, which explores "the future of learning in all its dimensions – covering cultural and technology trends, groundbreaking research, education policy and more" (About this Site section). Key sections include Big Ideas, Teaching Strategies, Motivation, Games and Learning. Cyberlearning researchers are also investigating the future of learning with technology. They are "oriented toward a technical and educational horizon approximately 10 years in the future" (Roschelle, Martin, Ahn, & Schank, 2017, p. 1). In their Cyberlearning Community Report, Roschelle and colleagues summarized six emerging genres (Table 3) and provided resources and examples throughout. Community Mapping "Using mobile, geospatial tools for learning in context at the scale of a neighborhood, community, or city." Smart and Connected Communities for Learning. Expressive Construction "Computing as a creative literacy, focusing on students’ expressiveness, ability to represent STEM ideas, and sharing of emerging understandings." Cutting Edge of Informal Learning: Makers, Mobile, and More! Collaborative Learning with Touch Interfaces "Expanding collaborative learning via multitouch interfaces on tabletop, tablet and mobile computers." Technology for Mathematical Argumentation Per the TMA website: "The TMA project aims to create mathematical computation tools that enable students to learn and demonstrate algebraic reasoning prior to learning about formal algebraic proofs." TouchCounts offers two sections: Numbers World and Operations World. Per the website: "In TouchCounts, children use their fingers, eyes and ears to learn to count, add and subtract. By using simple gestures to create and manipulate their own numbers, children develop a strong number sense." Technology (e.g., computers of all kinds, Web 2.0 and the social internet) is changing the learning process within mathematics education in ways Lemke and Coughlin (2009) noted (i.e., democratization of knowledge, participatory learning, authentic learning and multimodal learning) and in consideration of Siemens (2005c) theory of connectivism. In terms of authentic learning, computers enhance the process of mathematics education by eliminating the need for learners to perform all calculations by hand and enabling them to explore "richer" real-world problems that they will encounter in everyday life and in the workplace. Indeed, in his 2010 TED talk, Teaching Kids Real Math with Computers, Conrad Wolfram of Wolfram Research said "the part of math we teach — calculation by hand — isn't just tedious, it's mostly irrelevant to real mathematics and the real world." This latter is one of the reasons kids lose interest in math. Tools and practices of user-generated content, as well as the internet participatory trends of co-production, crowdsourcing, and open educational resources can powerfully support mathematical authoring. For community mathematics, free, well-designed communication platforms such as nings, blogs, wikis, microblogging, forums, aggregators, and distributed content mash-ups can support online and local math clubs and math circles, topical discussion and study communities, and networks growing around a variety of particular math endeavors: competitions, educational philosophies, comic strips, books, or curricula.
. . . Web 2.0 brings several crucial changes to this field of executable mathematics, including zero-cost distribution of virtual manipulatives; an invitation for everybody to create their own math-rich objects through programming or “construction set” mash-up environments; situating math objects in multi-user virtual worlds; and ease of sharing and continuing development in open educational resource communities. Another resource illustrating community mathematics in Droujkova's framework (2009) is the National Association of Math Circles, which is for students. According to the Association (What is a Math Circle? section), "Math Circles are informal afternoon and weekend programs for K-12 students and their teachers, led by mathematicians and other mathematics professionals who teach through discovery, problem solving, and interactive exploration. As a result, participants involved in Math Circles explore, create, and communicate substantive mathematics, increase their problem solving skills, and, perhaps most importantly, develop an enjoyment of mathematics." Similarly, middle school teachers can take advantage of the Math Teachers’ Circle Network from the American Institute of Mathematics. Their math circles throughout the United States work to foster an enjoyment of mathematics among middle school math teachers within a culture of problem solving. Read more about the Math 2.0 framework and its relevance for math education in Dr. Patricia Deubel's article Web 2.0 in Instruction: Adding Spice to Math Education of February 17, 2010, in T.H.E. Journal. Not sure about math circles? Consider reading: Playing with Math: How Math Circles Bring Learners Together for Fun by Ingfei Chen (2015, February 6) posted at MindShift. Various definitions have been proposed for technological literacy. 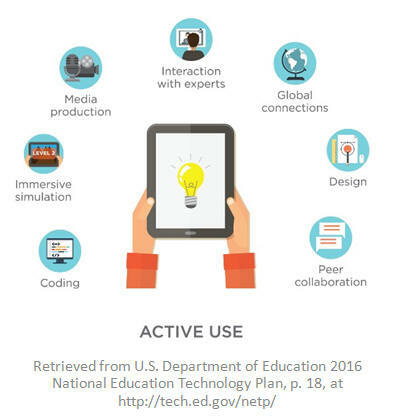 The International Technology Education Association (ITEEA, 2000) defined technological literacy as the "ability to use, manage, assess, and understand technology" (p. 9). Greg Pearson and A. Thomas Young (2002) stated that it “encompasses three interdependent dimensions--knowledge, ways of thinking and acting, and capabilities," with the goal "to provide people with the tools to participate intelligently and thoughtfully in the world around them" (p. 9). "Although technical competency is not the same as technological literacy, the development of skills in technology can lead to a better understanding of the underlying technology and could be used as a basis for teaching about the nature, history, and role of technology in our lives" (p. 11). The North Central Regional Educational Laboratory and the Metiri Group (2003) offered a definition of Literacy for the Digital Age. This definition includes basic literacy, scientific literacy, economic literacy, technological literacy, visual literacy, information literacy, multicultural literacy, and global awareness. "Technological literacy is knowledge about what technology is, how it works, what purposes it can serve, and how it can be used efficiently and effectively to achieve specific goals" (p. 15). Per the State Educational Technology Directors Association (2007), "Technology literacy is the ability to responsibly use appropriate technology to communicate, solve problems, and access, manage, integrate, evaluate, and create information to improve learning in all subject areas and to acquire lifelong knowledge and skills in the 21st century" (p. 1). Apply a fundamental understanding of the ethical/legal issues surrounding the access and use of information technologies(section: P21 Framework Definitions Document, pp. 5-6). The emergence and integration of ICT into instruction and student lives has given new meaning to Bloom's Taxonomy of cognitive objectives. Andrew Churches (2008, 2009) discussed an interesting set of new digital verbs for each of the levels in the taxonomy, reflecting new objectives in the road to literacy. He calls it Bloom's Digital Taxonomy Map, a must see. Thus, by integrating technology into K-12 schools, we are assisting with the development of technologically literate citizens. However, schools must also be aware of a conclusion reached by Ito and colleagues (2008): Given the diversity of digital media, "it is problematic to develop a standardized set of benchmarks to measure levels of new media and technical literacy" for our youth (p. 2). Kereluik, Mishra, Fahnoe, and Terry (2013) also proposed that digital and ICT literacy is just one of nine subcategories within three categories of knowledge necessary for the 21st century: foundational, humanistic, and meta. Foundational knowledge includes digital and ICT literacy, core content knowledge, and cross-disciplinary knowledge. Humanistic knowledge includes job and life skills, ethical and emotional awareness, and cultural competence. Meta knowledge focuses on creativity and innovation, problem solving and critical thinking, and communication and collaboration. Educators need to be aware of the effect of technology on the acquisition of each type of knowledge. The authors recognized that there is some overlap in categories and subcatagories, and viewed foundational, humanistic, and meta knowledge being of equal importance. Their analysis revealed a much needed scheme giving "us a "big picture" of what we mean when we say 21st century learning" (p. 133). Consumer technologies find their way into schools because people use them at home, for recreation, or professionally. Examples include 3D video, drones, electronic publishing, mobile apps, robotics, tablet computing, telepresence, and wearable technology. Digital strategies are ways of using digital devices and software in both formal and informal settings. Among strategies are Bring Your Own Device, the flipped classroom, games and gamification, location intelligence, makerspaces, and preservation/conservation technologies. Enabling technologies "expand the reach of our tools, and make them more capable and useful, and often easier to use as well" (2014, p. 32). There are multiple examples to illustrate. Among those are cellular networks, electrovibration, flexible displays, geolocation, machine learning, mobile broadband, natural user interfaces, next-generation batteries, open hardware, robotics, speech-to-speech translation, statistical machine translation, virtual assistants, and wireless power. Internet technologies "include techniques and essential infrastructure that help to make the technologies underlying how we interact with the network more transparent, less obtrusive, and easier to use" (2014, p. 33). Consider technologies such as cloud computing, the Internet of Things, real-time translation, semantic applications, single sign-on, and syndication tools. Learning technologies are tools and resources designed for education. They "include technologies that are changing the landscape of learning, whether formal or informal, by making it more accessible and personalized" (2014, p. 33). Adaptive learning technologies, badges/microcredit, learning analytics, MOOCs, mobile learning, online learning, open content, open licensing, and virtual and remote laboratories exemplify this category. Social media technologies are characterized by keywords such as collaborative environments, collective intelligence, crowdfunding, crowdsourcing, digital identity, social networks, and tacit intelligence. Visualization technologies range from "simple infographics to complex forms of visual data analysis. What they have in common is that they tap the brain’s inherent ability to rapidly process visual information, identify patterns, and sense order in complex situations" (2014, p. 33). Examples include 3D printing/rapid prototyping, augmented reality, information visualization, visual data analysis, and volumetric and holographic displays. Technology integration, as defined by the National Forum on Education Statistics (2005), Forum Unified Education Technology Suite, "is the incorporation of technology resources and technology-based practices into the daily routines, work, and management of schools" (Part 8). Resources are computers and specialized software, network-based communication systems, and other equipment and infrastructure. Practices include collaborative work and communication, Internet-based research, remote access to instrumentation, network-based transmission and retrieval of data, and other methods. Aditi Rao (2013) of TeachBytes made a concise comparison of "using technology" versus "technology integration." In her view of "using technology," technology use is random, arbitrary, and often an afterthought. Technology is rare and sporadically used in the classroom, used for the sake of using technology, used mostly by the teacher to instruct learners on content. It's used more to complete lower order thinking tasks, and more instructional time is spent learning how to use the technology itself. Learners would use it primarily for working alone. Technology is used to facilitate activities that are feasible or easier to complete without technology. Technology is used to deliver information and is peripheral to the learning activity. Whereas, in her view of "technology integration," technology usage is planned and purposeful; technology is a routine part of the classroom environment and used to support curricular content and learning objectives. Technology is used to engage students and is used mostly by them. The focus on using technologies is to create and develop new thinking processes. More instructional time is spent using technology to learn. Technology is used to encourage higher order thinking skills, to facilitate collaboration in and out of the classroom, and to facilitate activities that would otherwise be difficult or impossible. Technology is used to construct and build knowledge. It is essential to the learning activity. Are teachers and students proficient in using technology in the teaching/learning environment? To what extent (percentage) has technology been integrated in the teaching/learning environment? Do teaching and learning standards and student assessment include technology proficiencies and measures? Do administrative standards include technology proficiencies and measures? Are administrators and support personnel proficient in using technology for school management? Is technology incorporated into administrative processes? Is technology proficiency integrated into evaluation of instructional and support staff? What's your level of technology integration? Use the Technology Integration Matrix, developed by the Florida Center for Instructional Technology, to determine your level of technology integration: entry, adoption, adaptation, infusion, or transformation. Per its description, the 25 cells in the matrix incorporate "five interdependent characteristics of meaningful learning environments: active, collaborative, constructive, authentic, and goal-directed." Gasser, U., & Palfrey, J. (2009). Mastering multitasking. Educational Leadership, 66(6), 15-19. Greaves, T. (2012). This time it's personal. T.H.E. Journal, 39(1), 33-36. Kelleher, K. (2006, July). Personalize it. Wired Magazine, 136. Lemke, C., & Coughlin, E. (2009, September). The change agents. Educational Leadership, 67(1), 54-59. Pearson, G., & Young, A. T. (2002). Technically speaking: Why all Americans need to know more about technology. The Technology Teacher, 62(1), 8-12. Richey, R. C., Silber, K. H., & Ely, D. P. (2008). Reflections on the 2008 AECT definitions of the field. TechTrends, 52(1), 24-25. Riley, B. (2017, March). Personalization vs. how people learn. Educational Leadership, 74(6), 68-72. Saettler, P. (2004). The evolution of American educational technology. Greenwich, CT: Information Age Publishing. Sprenger, M. (2009, September). Focusing the digital brain. Educational Leadership, 67(1), 34-39. Tomlinson, C. (2017, March). Let's celebrate personalization: But not too fast. Educational Leadership, 74(6), 10-15.